Today is my 57th birthday so obvisously I am the mother of the K and K team. Over the years, my favorite birthday treats were Angel Food cake with strawberries and Grandmom's Icing or Grandmom's cream puffs made with custard inside. 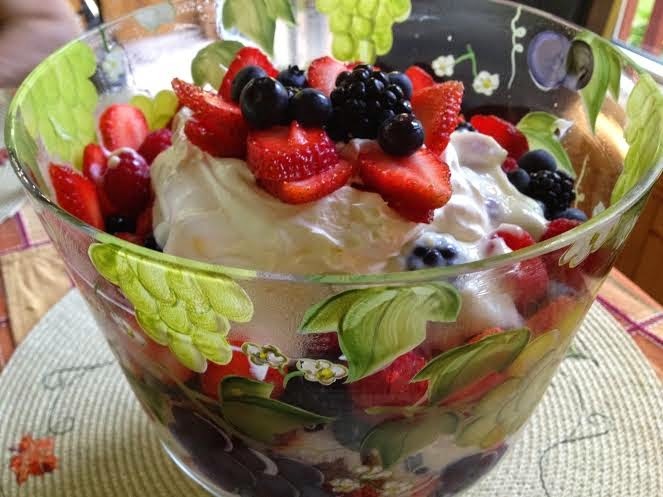 So today for my birthday, I wanted to share this Summer Berry Trifle that combines some of the best of both desserts. This also is a beautiful dessert to celebrate the 4th of July with the combination of the red, white and blue. It is super easy to make so you still have time to whip one up for your celebration today. Happy 4th of July to all of our followers and remember the fireworks are really celebrating my birthday (that is what I was told growing up by my family)! In a medium saucepan, stir together the custard powder and ¼ cup sugar. Slowly add milk, whisking to prevent lumps. Bring to a boil over medium heat, stirring frequently. Transfer the custard to a heatproof bowl and set it in a larger bowl of ice, stirring occasionally until completely cooled, about 10 minutes. Mix in the yogurt and vanilla. To assemble the trifle, spread ½ cup of the custard in the bottom of a 3 to 4 cup or liter glass bowl (I used an actual trifle bowl). Stand some of the sliced strawberries in a ring against the sides of the bowl. Add half of the cake cubes and dizzle1 tbsp of liqueur over the cake. Add half the berries and half of the remaining custard. Repeat layers. Recipe can be made ahead up to this point. Cover and chill in the refrigerator over night if wanted. To finish before serving, lightly toast almonds in a skillet over medium heat until golden. Cool to room temperature. Using an electric mixer, whipping cream to stiff peaks, gradually beating in remaining sugar. Spread the whipping cream over top of the trifle and sprinkle with the toasted almonds and serve.